Meet the mighty Master of Magnetism! 10 1/2-inch tall action figure shows off Magneto's immense power. His cape features a unique "magnetic force" texture that differs from a traditional cloth cape. He comes with interchangeable hand, face, and effect parts, plus a display stand! The Master of Magnetism gets a Play Arts Kai makeover that's sure to attract fans of the Marvel universe! 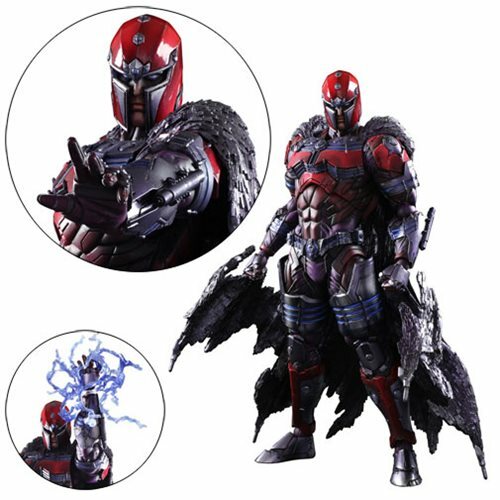 This Marvel Universe Magneto Variant Play Arts Kai Action Figure features a hefty weight and structure that really shows off the popular mutant's immense power. Magneto projects an air of overwhelming strength befitting a mutant with powers capable of manipulating even the Earth's magnetic fields. To express his special abilities, Magneto's cape is designed with magnetic forces in mind. The concept of a collection of small iron sand and metal pieces pulled together by magnetic force serves as its inspiration, creating a unique texture that differs from a traditional cloth cape. The application of the paintwork creates a stark contrast between light and shadow to emphasize his weighty presence. Magneto comes with expressive interchangeable hand, face, and effect parts, plus a display stand. Measuring about 10 1/2-inches tall, he's packaged in a window box. Ages 15 and up.